Each year the President of the Warblers Club selects a Warbler who, during the year, has exemplified The Warbler Spirit. In 2001 the Board of Directors of Warblers Club, Inc. renamed the award the "Charles Wayne Brand Warbler Spirit Award" in honor of Wayne Brand, who was a model of The Warbler Spirit for many years. 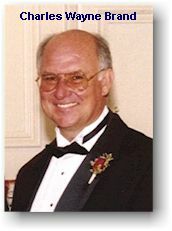 Wayne Brand was one of the original organizers of the Warblers Club Reunion in 1988 and served as Vice President of Warblers, Inc. at its formation. He served Warblers, Inc. in many capacities over the years including serving as President in 1991 - 1992 and as Treasurer and as a member of the Board of Directors at various times. Wayne was a Woodlawn High School Warbler (Class of 1962) and served Warblers Club, Inc. tirelessly and passionately for many years until his untimely death from cancer in the spring of 2001.